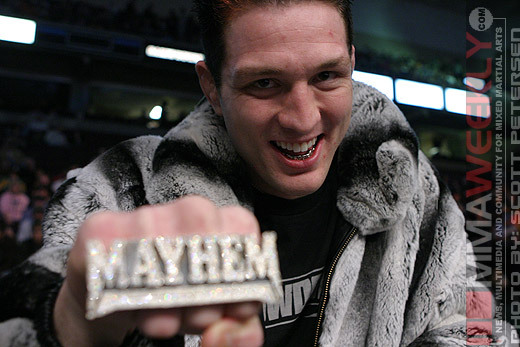 It didn’t take long for the UFC to find a fight for Jason “Mayhem” Miller for his return to the Octagon. He will face Aaron Simpson at UFC 132 in July. The UFC made the announcement about the new match-up on Saturday. Miller (24-7) just confirmed his new deal with the UFC on Friday after spending the last few years in several different promotions including Strikeforce and Dream. The colorful man known as “Mayhem” has been out of action since last September when he picked up a win over iconic fighter Kazushi Sakuraba in Japan. Challenging Miller in his UFC return will be Arizona fighter Aaron Simpson (8-2), coming back after a dominant performance over Mario Miranda in March. Simpson just recently opened a new gym, Power MMA & Fitness, alongside teammates Ryan Bader and C.B. Dollaway, as well as an NBA player from the Miami Heat, Mike Miller. Simpson will look to derail the Mayhem hype train before it ever gets rolling. The bout between Miller and Simpson will likely be televised in some form on the UFC 132 show happening on July 2 in Las Vegas.